Hello guys! One more flying car for Attack of the Cyber Octopuses film project, where everything will be done using Practical Effects, without using CGI (except for compositing and for retro graphics). 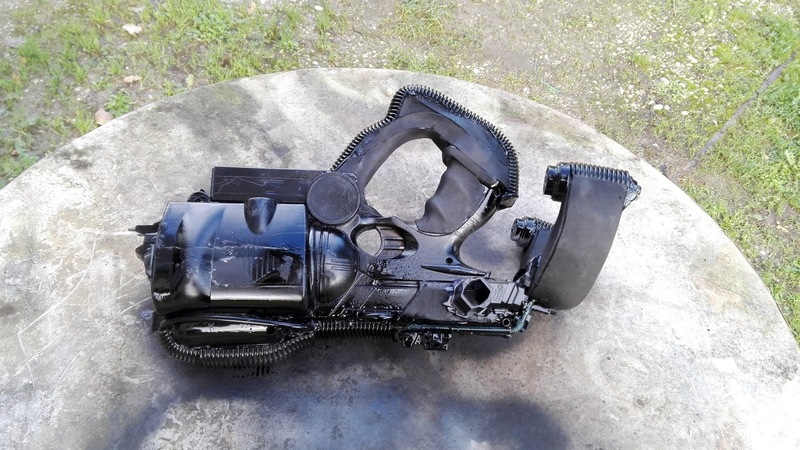 For this vehicle I don't have many photos, but the procedure was similar to the VOLKSWAGEN GOLF or the MAZDA SAVANNA. 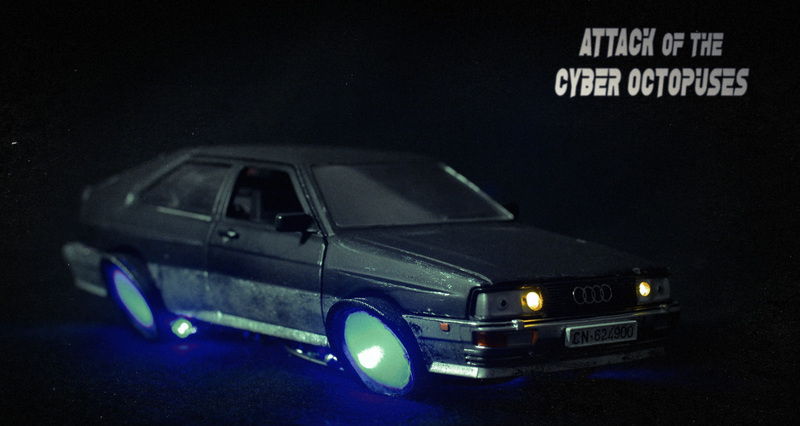 I only used car from the 80s with a cool/futuristic design to fit this awesome project! The only difference between the Audi and the other ones, is that this time I used a diecast model instead of a plastic one kit. Hardest par was to take it apart and drill the holes for the LEDs.... but here the steps! This is how the car looks like out of the box and ready to be destroyed! 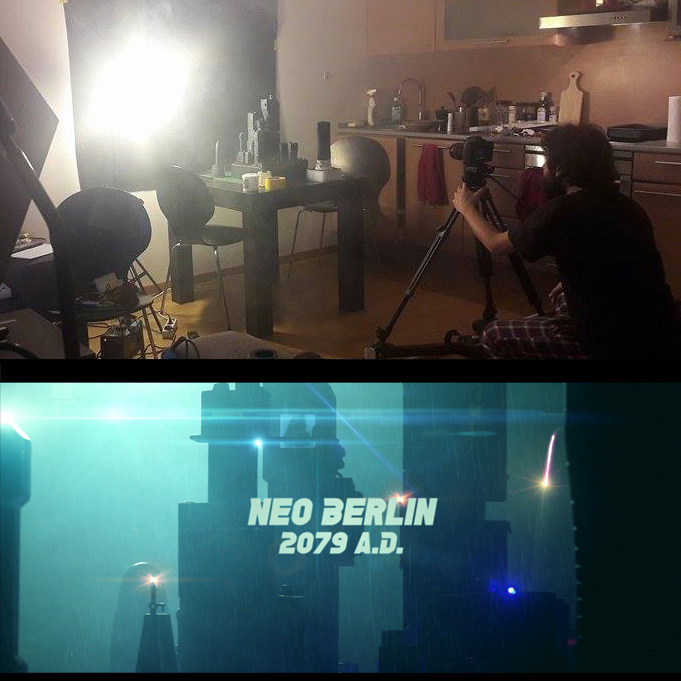 First coat of black paint... yeah, everything is pretty dark in Neo-Berlin 2079 AD. Again, I didn't wanted a contemporary metallic glossy effect, but a matte, dirty and worn one! So I used silver acrylic to mess everything a bit and also black one on the gray plastic parts, for the same effect. 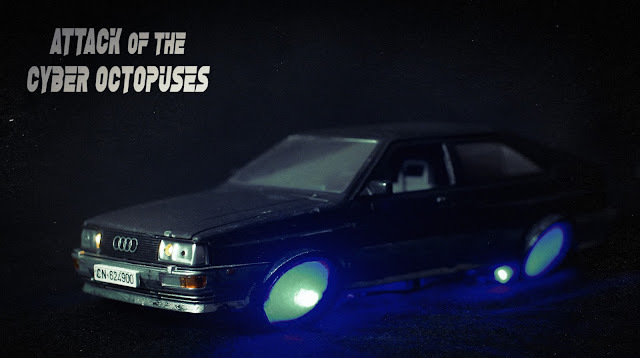 As always, wiring the LEDs it's a big challenge, especially on a diecast model, but it's working! And here the final fancy pictures! Soon you'll see those vehicles flying around a futuristic city on a 1 minute teaser of the film that we'll release in a couple of weeks! Stay tuned on the facebook page, instagram or twitter... and please remember to share it around! Also consider to make a small donation using the PayPal button, just a couple of bucks can helps us carrying on... THANKS! Be in touch for the next model! Master of Octopuses Weapon! 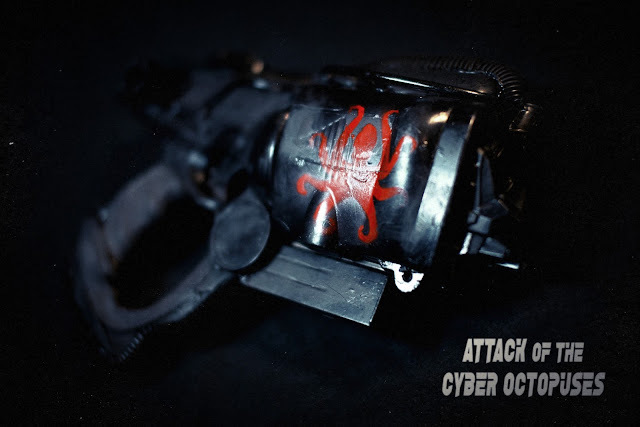 Nerf Maverick heavily modded for "Attack of the Cyber Octopuses" film project! 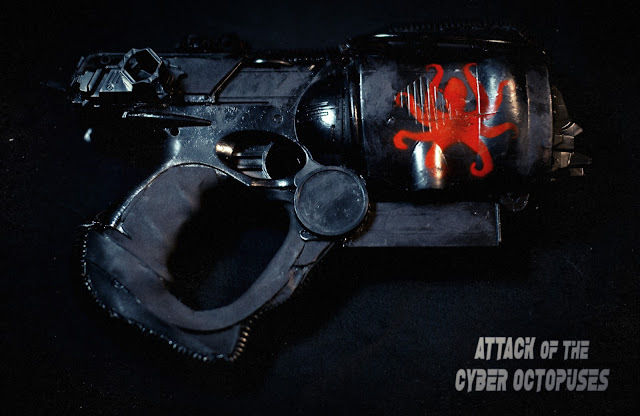 Welcome to the "making of" of the Master of Octopuses weapon! The villain of the film project ATTACK OF THE CYBER OCTOPUSES! 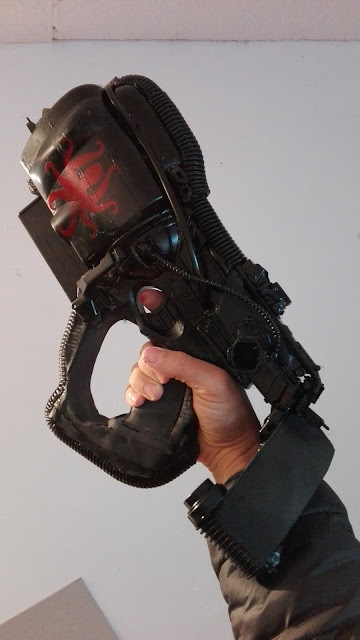 One more time the prop is made by Luca Baggiarini, check out his vimeo channel to watch some of his cool movies! 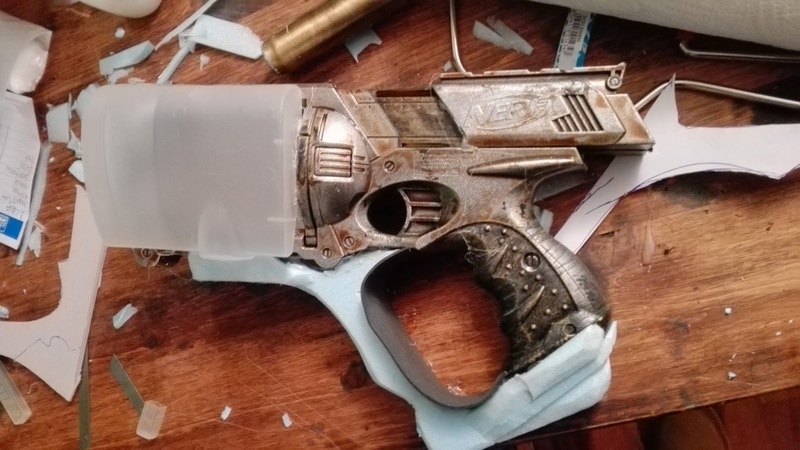 He started from a standard NERF Maverick toy gun, adding some styrene on the handle and doing a first coat of paint. Unhappy with the result, Luca decided to add some more pieces and restart the painting. 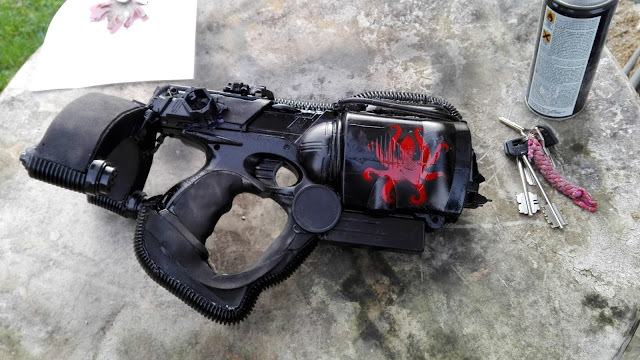 The final touch was adding an octopus logo stencil, to make it more original and clearly different from the other characters weapons. This is the final result! 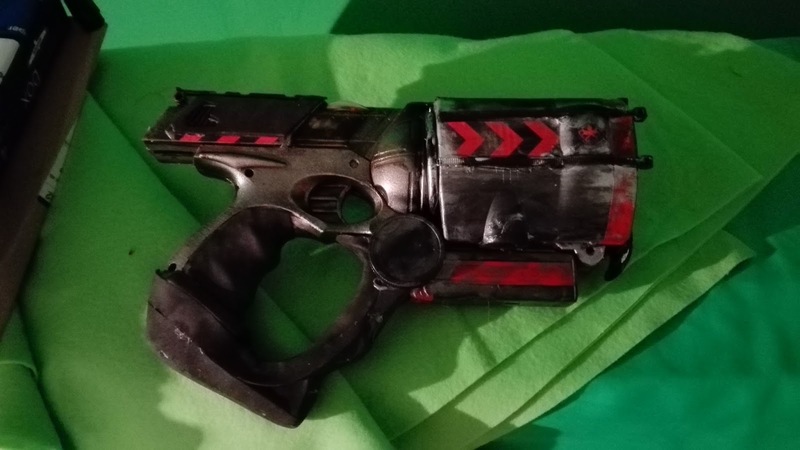 And here the fancy photos to present the weapon! Pretty badass, uh? I reccomend you being updated about this project on the facebook page, instagram or twitter... and please remember to share it around! We need support from every one of you! And also consider to make a small donation using the PayPal button, just a couple of bucks can helps us carrying on... THANKS! Be in touch for the next model! Kit-Bashed Futuristic City! "Attack of the Cyber Octopuses" film project. Hello Guys! 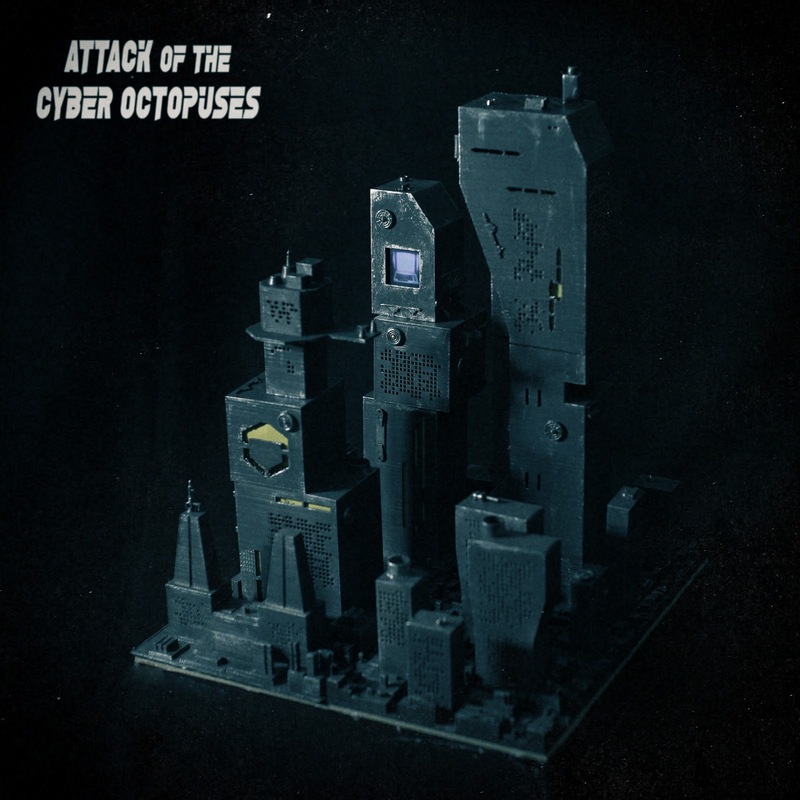 I'm keep working on my project "Attack of the Cyber Octopuses". 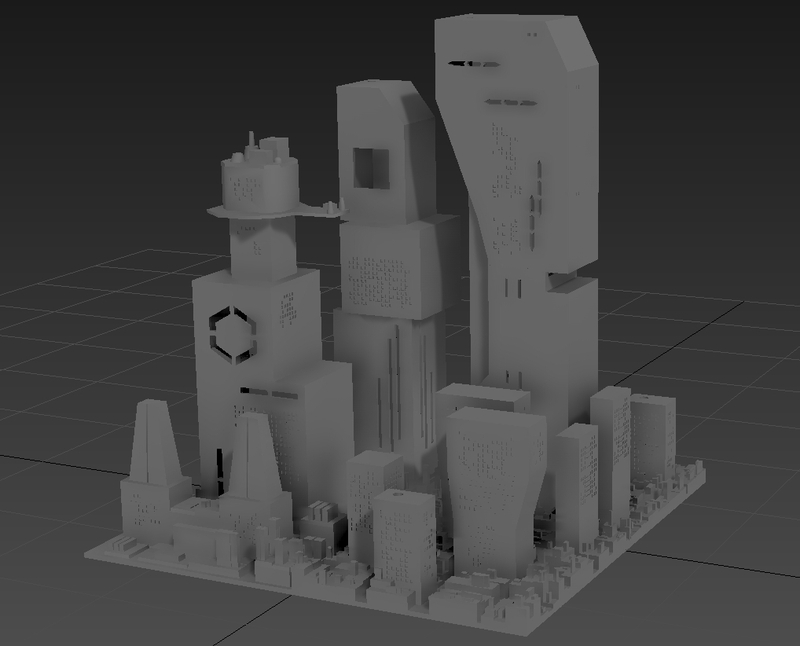 It has been a very busy period while I was shooting a 1 minute teaser and worked hard on the city scaled model. 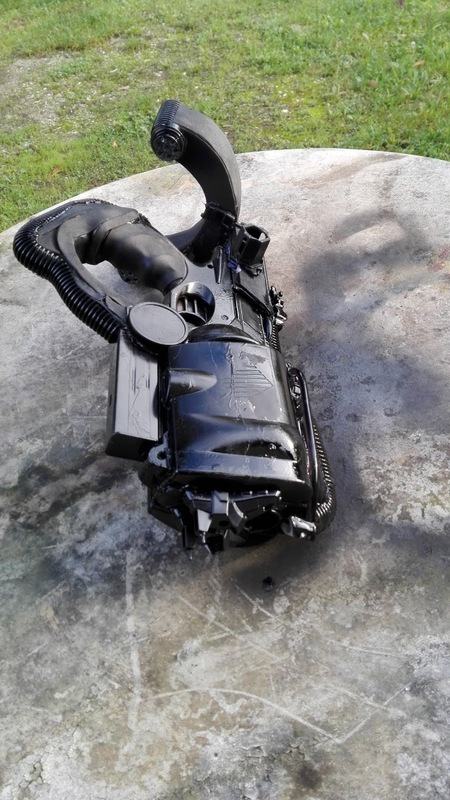 I want to remind you that this is an indie no-budget project, I'm invesing myself lot of energy and some savings. If you like it, please consider buying me a virtual beer by donating just few bucks using the PayPal donation button that you can find around the blog or on the official website. So well, I wanted to create a 1 meter tall building to have some cool shooting around it. 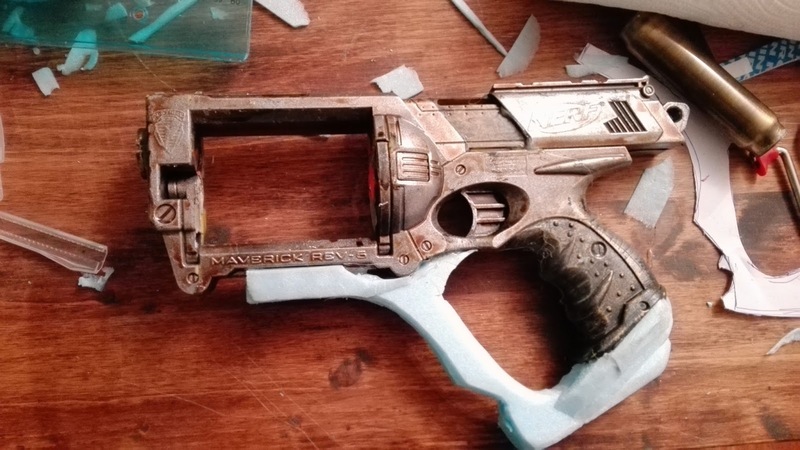 I started collecting some junk around and I 3D printed some "frames". I then cutted some cardboard to create cheap greeble parts. Then I used foamboard panels and I started to glue on them lot of different things, mainly garbage! This is how the 3D printed parts and some foamboard sheets look like, as well as with some stuff glued all around! I then started to give everything a darker and worn tint, mixing water with acrylic black paint and putting it all around using a small sponge. Starts to be pretty cool, uh? I then paintedmore colors around... and attached some signboards printed on paper and some transparent sheets darkened out with smoke spray paint. Final touch was scattering around some toy cars! It was then time to put some LEDs and in the squares holes I used an old mp3/mp4 player and an old smartphone to play videos!!! Now that the main building is done, I made two secondary "towers". I made them more quickly since they'll be in the background and they're not so detailed as the main one. Everything was ready for filming!!! But first, some vintage photos (yes, that's still me). 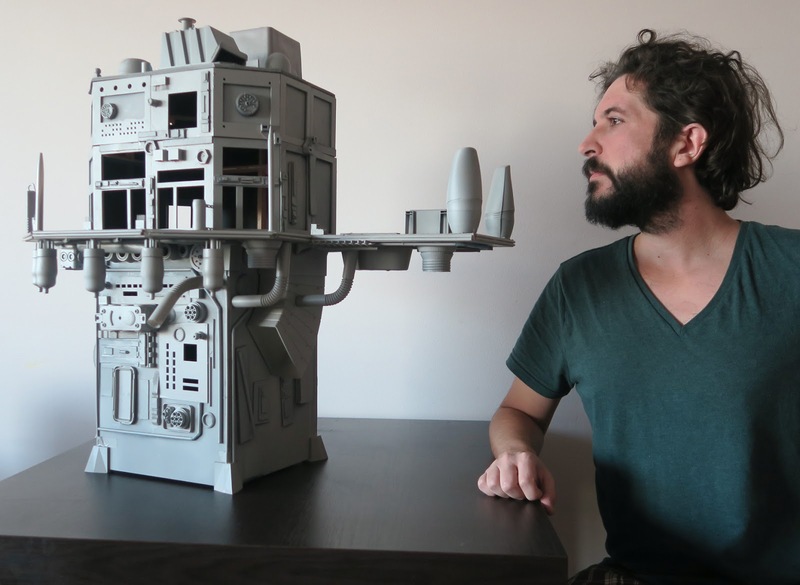 I always loved the backstage photos of Blade Runner or Star Wars, and now I can proudly say that I made something similar! And this if the final result!!! Incredible how it looks so professional, considering everything was made super cheap, filmed in my living room with a Canon 5D MII, using just 2 standard bulbs for the backlight and a €50 fog machine! That's it. I hope you enjoyed this "making of" and remember to share it around, as well as the social media pages!